To say I was daunted by the invitation to give this lecture would be an understatement. While I have some knowledge of political life, my study of Catholic Social teaching has been rudimentary. So I set to work and read, for the first time in my life, numerous of the documents of Vatican 11. I also revisited some of the important Papal Encyclicals on Catholic Social Teaching. 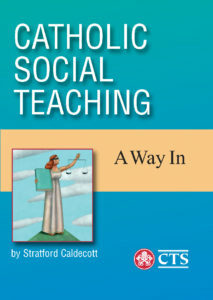 I found “Catholic Social Teaching, A Way in” by Stratford Caldecott, published by the CTS, to be a book that lives up to its title. It is indeed “a way in” to the subject, that is lucidly written, brief, and accessible. In all this reading, I discovered something that should not really have surprised me. Although I might not have realized it at the time, Catholic Social thought influenced my views about political, economic and social questions, throughout my public life. I will try to illustrate this in this lecture, and to do so I will refer to developments in Irish and European life over the past 55 years, in which I was involved to some degree. The extent to which Catholic Social Thinking influenced my politics was not the result of abstract thought, or personal study of Encyclicals , because I did neither, but through day to day confrontation with difficult issues, and the Christian influence and example of other people on the way I looked at them. I attribute the latter to my parents and extended family, to my teachers (Dominican nuns in Cabra and Jesuit fathers in Clongowes), to the priests in my parish in Dunboyne (to whom I probably was listening on Sundays more than I, or they, thought) and, more recently and importantly, to my wife, Finola. I entered politics at the age of 18 when I joined the Fine Gael party in Dunboyne in 1965. I was elected to Dail Eireann at the age of 22 in 1969, just as the conflict in and around Northern Ireland, was being transformed from a peaceful struggle for civil rights for PEOPLE, into an unwinnable sectarian war concerning sovereignty over TERRITORY. Concern about something human and alive, was being replaced by a conflict about something arid and theoretical. Argument was replaced by arson, and by other forms of deadly violence. One of my earliest speeches in Dail Eireann, in 1970, was in criticism of the alleged involvement of the Irish government Ministers in the importation of arms for use by nationalists in Northern Ireland, an illegal and reckless endeavour. From the beginning I was suspicious of the then prevailing attitude in the South of Ireland to the Northern issue. “Nationalists right, Unionists wrong,” would a fair summation of it. That attitude did not correspond to the Catholic idea that every human being has equal dignity with every other, nor did it correspond with the spirit of rational enquiry that had been encouraged by the education I had been privileged to receive. The civil rights (the elimination of discrimination in housing, jobs etc.) that had been sought had largely been conceded, but the IRA violence continued. The new goal was a coerced united Ireland. The IRA campaign, and the Loyalist reaction to it, did not constitute a just war. It did not meet the well known criteria for a just war. Put more simply, it was a breach of the fifth Commandment. Its dire consequences were foreseeable, and foreseen. Atrocity provoked atrocity, in a circle of pain. Trust was destroyed. It opened wounds that, notwithstanding the passage of time and the conclusion of political agreements, remain raw and painful to this day. More shockingly, we are even commanded to love our enemies. Our neighbour is all humankind. These are central concepts in our Faith to which I will return later, is different contexts. In the case of Northern Ireland, our neighbor is the person living on the OTHER side of the so called “peace line” in Belfast. Loving one’s neighbor is not a matter of mere sentiment. To love one’s neighbor, one must go out of one’s way to understand him or her, to understand how he or she sees the world, his politics, and his deepest fears. Too many in Northern Ireland fail to make that effort, and thus fail in their Christian obligation to love their neighbour. This failure is made too easy by the fact that two communities attend different schools (a Catholic church policy), follow different sports, and live in different neighbourhoods. The obligation to love one’s neighbor derives from the understanding we have, as Christians, of what it is to be human, of the inherent dignity of each human being, created by God. That global obligation was always there in the Catholic Church, but it took on a new universality in the declarations of Vatican 11 on “Religious Freedom” and on “relations with Non Christians”, issued just as I left school in 1965. I have no doubt they shaped my thinking, albeit indirectly. What is the meaning and purpose of our life? “the ground is removed from every theory or practice, which leads to a distinction between men and peoples in the matter of human dignity, and the rights which flow from it. ” foreign to the mind of Christ, any discrimination against men, or harassment of them because of their race, condition of life, or religion”. This spirit of openness others, expressed in the religious sphere by Vatican 11, echoed the breaking down of barriers between nations exemplified by the development, at the same time, of the European Communities, and of moves toward political integration in Latin America and Africa. Each of these are building blocks of the” single community” of peoples in the world called for in Vatican 11. Vatican 11 recognised the globalization that was already under way in the 1960’s. “joined together more closely than ever by social, technical, and cultural bonds”. That “joining together” of the world is much more advanced now, than it was at the end of Vatican 11 in 1965. A world that is interdependent, if it is not to destroy itself by destructive competition, or degradation of the natural world, needs a common set of rules. It is only through a commonly, agreed, interpreted and enforced, sets of rules, that we can really “take back control” . This is recognized in many Papal Encylicals. Hence the support of the Church for the growth of multinational rule setting institutions like the WTO, the WHO, the IMF, the Bank for International Settlements, and , of course, the most advanced democratic rule setter of them all, the European Union. The church has given important guidance here. One of my first political interventions was in 1966, and concerned what transpired to be an abortive attempt by Ireland to join the European Common Market. I turned up uninvited at a public meeting, organized by Sinn Fein to oppose The Common Market. The meeting was chaired by a man reputed to be the Chief of Staff of the IRA! From the floor, I challenged the platform speaker. The chairman, to my surprise, insisted I be given a fair hearing , and to my delight, I was able to get a scripted version of my pro Common Market views into the local paper. My political career was under way! I know some sincere Catholics in this country will disagree with me, but I believed then, and I believe now, that the work of bringing European nations together in peace in the EU, is, as a former party colleague of mine Joe McCartin said to me once, the nearest thing in politics, to God’s work. The EU is a democratic multinational rule maker. But it will not be held together by rules alone. Nor will any nation or society be held together by rules alone. There must be a shared moral sense, and a spirit of solidarity based on that, to give life and meaning to the rules. That shared moral sense can cover things that cannot, and should not, be regulated by public authorities. Individualism, and the promotion of individual rights, is never enough. An individual can only achieve fulfillment by working for, and with, other people. My individual Rights are nothing, if other people are not there, who are willing to spend their time and their money, to ensure that my rights are respected. “Today we ought perhaps to amplify the doctrine of human rights with a doctrine of human obligations and of human limitations”. Just because we can, does not mean we should. Science may tell us what we can do, but it cannot tell us what we ought to do. Science cannot give birth to an ethos. That is something that religion does. Catholic Social teaching reminds us of these things. Without getting directly into politics, the church can make a huge contribution to the well being of Europe and the world by reminding people of their ethical responsibilities, ethical responsibilities that go alongside their rights. The church can help set the tone of society, which is as important as any law. It reminds people of the sense, deep in the conscience of all human beings that there is an objective right and wrong, that there are moral facts, objective rights and responsibilities, that are just as important as any scientifically uncovered empirical facts. This “natural law”, this moral sense, is there in all humans everywhere, and Catholic teaching is one way of uncovering it. It is this moral sense that makes us human. The examination of conscience is the door to the natural law that is within each of us. It is an exercise that assures ethical behavior in business, sport, politics, and life. It precedes all law, and is more effective than any external auditor. The need for repeated examination of conscience was never greater, than it is today in a business world beset by widening income inequalities, narrow pursuit of shareholder value, and sometimes by scandals. Laws alone will never stop all abuse. Informed, muscular and repeated examination of conscience can do so. That is what will build trust between people. And numerous studies have shown that a society in which there is mutual trust will be happier and more prosperous. A society is not a collection of social atoms held in check by government acting as some sort of mutual insurance policy. A society is a set of overlapping communities, with obligations to one another, and trust between them. Returning to my own journey, I became Minister for Finance in 1981 at a time when the Irish state was on the brink of a financial abyss, because of the coincidence of recklessly expansionary fiscal policy from 1977, then followed by a deliberate and sudden hike in international interest rates by the US Federal Reserve, which left us cruelly exposed. In face of this, I had to introduce some hard budgets increasing direct and indirect taxation. I have to say that I did not fund Catholic Social thinking particularly helpful in confronting this budget crisis. It was, and remains, rare to find church leaders pronouncing in favour of fiscal prudence, or of matching ends with means, even though that is a moral, as well as a political, issue. The church advocates financial solidarity with the poor, particularly in times of fiscal crisis, which is right. But it is too often silent on the necessity for financial solidarity with future generations, which is the main argument for avoiding excessive accumulation of debts, deficits, and pension obligations, for which future generations will have to pay. Too often the church takes the easy route and leaves that particular moral question to politicians on their own. The church should apply to fiscal policy, the same concern about the inheritance we pass on to future generations, as it applies in its critique of the present generation’s degradation of the environment and the malign inheritance we are passing on in that respect. But the church is right to say that the market has limits. Indeed a market can only exist if there are rules, or limits. But rules are not enough, they cannot cover everything. We also need trust and ethics, phenomena that church teaching strengthens on a daily basis. Although I did have to introduce budgets that increased taxation dramatically, I am pleased to say I also introduced the largest ever increase in pensions and benefits for the less well off, a 25% increase in one year in 1982. I was also able to introduce incentives for all workers in a firm to own share in the business in which they worked, something advocated by Pope John XXII in his encyclical “ Mater et Magistra”. Unfortunately this good concept of employee shareholding has been applied selectively in many firms. It has been used to give disproportionately large increases in remuneration, through stock options, to just a few employees at the very top of some large firms. This works against the sense of solidarity, among all working in an enterprise, that should exist. It has enabled the gap in remuneration to get ever wider, especially so in US firms. These so called compensation policies are a deep structural flaw in modern capitalism, that may eventually undermine the permissive consensus among the public, on which capitalism depends. Returning to my personal narrative, I became Taoiseach in 1994, as a result of the breakup of the previous coalition government. Coming to office without having had a General Election immediately previously, was a blessing. I was able to take up the work of my predecessor, but without the burden of manifesto promises, which, as we see in the UK today, can be a constraint on common sense. Looking back, it is fair to say that one highlight of my term of office was the agreement in 1995 with the UK Prime Minister, John Major, of a Joint Framework Document, concerning Northern Ireland. The story of the Framework Document of 1995- in what it sought to do and in what flowed from it- will throw some light on the issue of a Irish backstop, which is so controversial today. The Framework agreement of 1995 between our two governments was later reflected, in a somewhat watered down form , in the Belfast Agreement of 1998, but to which there was also All Party Agreement, as well as just agreement between the two governments. “while maintaining the existing birthright of everyone, born in either part of Ireland, to be part of the Irish nation”. This was and remains crucial. To give effect to this birth right, we agreed to set up detailed arrangements for North/ South cooperation, which, because the UK and Ireland were both then in the EU , were completely compatible with Northern Ireland remaining part of the United Kingdom. The issue was not about the hardness or softness of the border, it was about ensuring mutual recognition and ease of cooperation, regardless of lines on a map. In the Framework Document, the two governments agreed that proposals for North/ South cooperation could include, at the executive level, a range of functions, including infrastructure, marketing and promotion activities and culture. We further agreed the Governments would make proposals, at the harmonising level, for a broader range of functions, including agriculture and fisheries; industrial development; consumer affairs; transport; energy; trade; health; social welfare; and economic policy. This harmonising of policy was to give practical effect to the commitment we had made, that all in Northern Ireland who wanted to, could be part of the Irish Nation, but without leaving the United Kingdom. of both communities in Northern Ireland. Instead of converging, Brexit without a backstop would mean the two parts of Ireland are deliberately diverging. Standards and qualifications are to become different, in the name of taking back control. Brexit without a backstop would involve the dismantlement of a painfully constructed, but still half built, structure of peace on the island of Ireland. The decision on Brexit was, I fear, undertaken, without sufficient thought to the effect it would have on Britain’s nearest neighbours. As I said earlier, to fulfil one’s Christian duty to love one’s neighbor, one must go out of one’s way to understand one’s neighbour, to understand how he sees the world, his politics, and his deepest fears. That obligation of charity applies to nations and states, to statecraft, just as it applies to individuals. As I said earlier it is inconsistent with that duty of love, to fail properly to consider the effects of one’s actions on others, particularly on one’s nearest neighbours. It is important that the British people understand what they are doing by Brexit, and thus why there has had to be a so called Irish backstop. Returning to my own narrative, when my time as Party Leader ended, I was fortunate to be appointed in 2002 as one of the representatives of Dail Eireann to the Convention on the Future of Europe, the body charged with revising the EU Treaties. I was elected to the Praesidium of the Convention. One of the ideas I promoted there was the inclusion in the Treaties, of a reference to belief in God as one of the sources of inspiration for the European Union, using a wording derived for the Polish constitution. This was not acceptable to the Liberal and Social Democrat members and had no majority. Another proposal which did get support was one that recognised the special position of the churches in Article 17 of the Treaty. This has formed the basis for a dialogue with the churches. It also safeguards their independence. Like families, churches are a necessary mediating structure between the individual and the state. This Treaty Article means EU law cannot be used to supercede the protections given to churches in national law. In 2004, I was appointed to be the Ambassador to the European Union to the United States of America. The US is very different from Europe. The vast majority of its population are the descendants of recent immigrants, of strangers who arrived, often friendless and lonely, in a strange land. The sense of rootedness, that we take for granted here in Europe, has had to be constructed anew in America. This explains the brashness of American culture. It also explains it religiosity. Churches, provided, and continue to provide, a focus for community and for setting down roots for Americans, in way that is not so necessary here in Europe. That is why Americans are much more open about their religious affiliations than we are. This highlights an important role the church can play in alleviating the problems of modern, urbanised, society, not just in the US but all over the world. This work of community building that churches perform is still needed, now more than ever. Let me illustrate why I say this. The Global Risks Report of the World Economic Forum says that mental health problems affect 700 million people in the world. It says that, since 1990, depression has increased by 54%, and anxiety disorders by 42%. There is an especial problem among young people. “81% of 18 to 25 year olds said getting rich was their generations top or second from top goal, compared to 62% of 26 to 39 year olds who said that”. It refers to the increased stress factors in young people’s lives…violence, poverty and loneliness. 22% of people here in the UK feel lonely either sometimes, often, or always. In the US, people report having fewer close friends, on average 2.1 friends in 2013, as against 2.9 in 1985. Living alone is associated with urbanisation. Solitary living has reached 60% in Stockholm, 50% in Paris and 94% in mid town Manhattan. Loneliness is associated with poorer sleep quality, and thus less personal resilience in face of the challenges of daily life. Meanwhile use of social media has led to declines in empathy, the ability to put oneself in the shoes of another. This is something the church directly addresses in its daily work. Technology may also begin to devalue work, as a means of developing a sense of self worth. These development are illustrated in opinion polls quoted in latest edition of the Atlantic monthly suggests that, among 18 to 34 year olds in the United States, self assessed “happiness” has declined, most dramatically among males. This happiness recession is associated, among other things, with a decline in the rate of marriage, and a decline in religious attendance. Married young adults are 75% more likely to report that they are very happy compared with their peers who are not. The share of young adults who are married has fallen from 59% to 28% since 1972. The decline in happiness is also associated with a decline in religious involvement. Young American adults who attend a religious service at least once a month are 40% more likely to report that they are happy, than those who do not. Religious attendance among young adults has also fallen since 1972, from 38% to 27%. Interpreting all this data is challenging. It is not always clear what is the cause and what is the effect. But the data does suggest that there is much work for the church to do, that there are many modern challenges to which Catholic Social thinking must respond. How? I will sum up what I am saying very briefly. At its most minimal, the church offers a sense of belonging, an antidote to loneliness through participation in religious services and activities. More importantly, it offers a sense of the value of each human life, from conception to natural death, a rational basis for keeping a sense of proportion about contemporary problems in life, in light of our eternal destiny. It helps us to puts suffering and setbacks in their proper context, and not to obsess about them. We must not be consumed by the things of this world, and by our own short lives. Most importantly, the message of the Resurrection is absolutely essential to our faith. Christ died and rose again, so we may live eternally.